PERTH HUMMER LIMOUSINES – WEDDING LIMOUSINE HIRE PERTH. White Chrysler stretch 300c Limousine Hire. 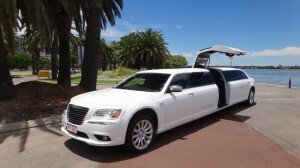 Hummer Limousines hire Perth offers a beautiful white 300c Chrysler limousine for hire. This elegant 11-seater limousine features all of the optional extras including smooth handling and sleek design, providing the ultimate first-class luxury experience. The meticulously detailed 300c Chrysler is available for every occasion and event, and is particularly suitable for weddings and receptions. Stand out from the crowd in Perth newest, 11 seater White Chrysler limousine! With nothing spared this will definitely guarantee you arrive in style! For all your Perth Chrysler Limo enquiries contact us at Hummer Limo Perth today to book your amazing Chrysler limousine ride.